on sale in Manila, Philippines. China uses historical maps with the so-called “nine-dashed line” as evidence. getting caught with the “wrong” maps can result in a hefty fine of up to $31,000—or criminal charges. When it comes to maps, China isn’t messing around. Starting next year, you don’t want to be caught with the “wrong” maps—that is, maps containing content “that endangers the country's sovereignty, safety and interests,” according to a statement by China’s government mapping official Le Weibin. In an effort to “boost” the mapmaking industry—and clamp down on maps that run counter to the government’s stance on issues like Taiwan’s independence and the territorial dispute over the South China Sea—China announced new regulations earlier this year on the creation, distribution, and publication of both print and online maps. The government will be monitoring maps for violations like “errors in compilation” and “leaks of secret geographic information and personal information,” according to China’s official state media, Xinhua. Also included in this new set of regulations, which will replace mapping laws drawn up in 1995, is a section dedicated to regulating the fairly young industry of online mapping. It requires all online mapping data to be hosted by servers inside the country, and all GPS providers to obtain a cartography certificate. Details remain fairly vague for now, but CCTV News reports that violators can face up to 200,000 yuan, or about $31,000, in fines. Businesses can also have their licenses suspended or revoked. If the violation is deemed serious enough, they can even find themselves booked on criminal charges. But the tough stance on maps isn’t new. The Los Angeles Times reported in October that customs officials at airports often go through travelers’ belongings looking for anything pushing back on China’s official political stances. Scholars, expatriates, and reporters alike have had to abandon maps, globes, and books that rendered Taiwan in a different color than the one used for China or that failed to indicate disputed islands in the East China Sea* as the Diaoyu Islands. That’s because to China, maps are more than just a navigational tool, especially as tensions rise between the country and its neighbors over those islands. The new ordinance will also cover online mapping. and must acquire an official certificate. 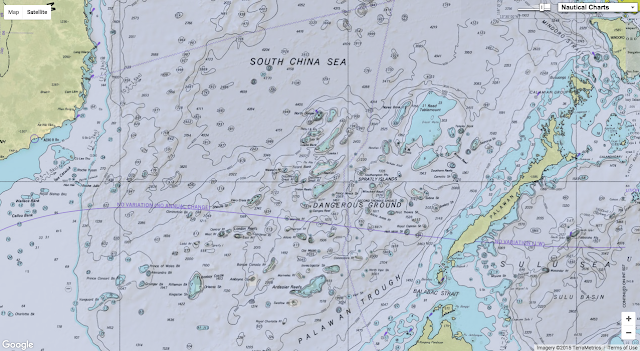 In July, Google Maps came under fire from the Chinese government for removing the Chinese name for the Scarborough Shoal, a rich fishing ground in the South China Sea that both China and Philippines lay claim to. The move from Google came after persistent petitioning from Filipino fishermen, who said the Chinese name effectively gave credibility to China’s claims. 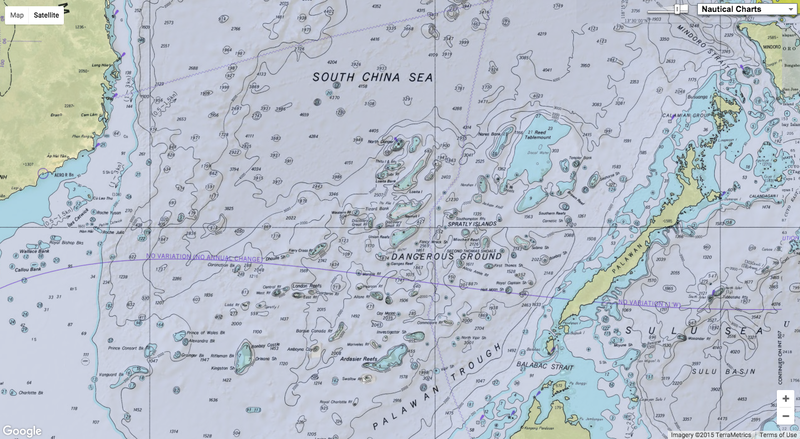 China has also used historical maps reinforce its claim to the Scarborough Shoal. Those maps include the so-called “nine-dashed line,” which was first drawn in 1947 by the Nationalist government. 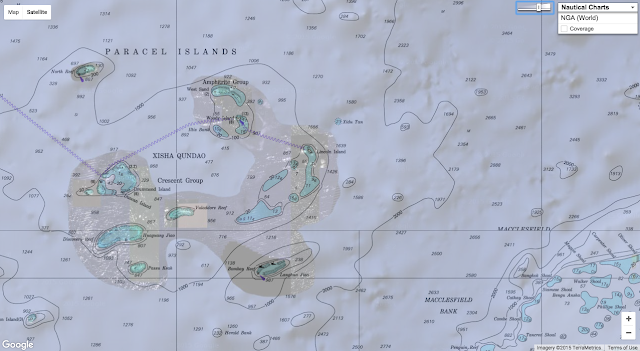 And while the history of how this line came to exist is murky—even to Chinese officials—China declared it as sufficient evidence of the country’s ownership of the islands, according to Reuters. “The dotted line of the South China Sea indicates the sovereignty of China over the islands in the South China Sea since ancient times and demonstrates the long-standing claims and jurisdiction practice over the waters of the South China Sea,” Chinese officials wrote in a statement to the U.S. embassy in Beijing. "Regimes that are anxious about their legitimacy fetishize the signs of legitimacy," said Tim Brook, a professor of Chinese history at the University of British Columbia and author of "Mr. Selden's Map of China," a book about an East Asia map from the 1600s. "So one of the signs of legitimacy is a map—there you are one color, your borders are all drawn properly and you look like a proper state."